We hope this finds you well as we have entered June and find ourselves in early summer. 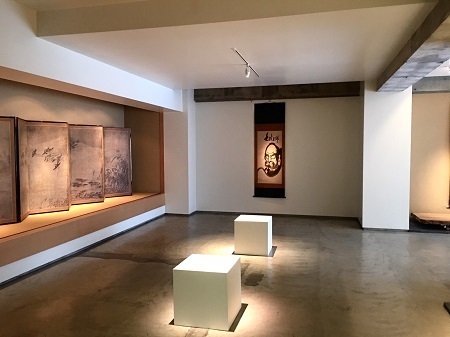 Greeting visitors to our latest exhibition at the Shirokane gallery is a large painting of the Zen patriarch Daruma, by Hakuin Ekaku (1685-1769). 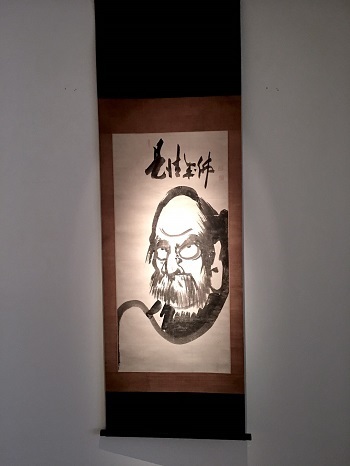 Hakuin is the famed Edo period monk credited with the revival of the Rinzai sect. At the age of 31 he became the chief abbot of Shoinji, and spread the teachings of Buddhism throughout Japan. He published a great deal, and was also a prolific painter and calligrapher, using large-scale works to teach common people about Zen. From the time of the Meiji period, great interest developed in his work and his name became widespread. Paintings of Daruma, such as the present piece, are perhaps the most representative of Hakuin's work. Powerful works such as this leave veiwers with a strong impression. With its strong lines and and upward rolling eyes, we hope you will not miss the chance to come see this work in our latest exhibition!